Norway is the stuff of legends. It is a land made of mythical tales, where fiction and reality collide along blurred lines: Thor and Asgard, Vikings and fjords. A place where rainbow bridges span the heavens and slabs of raw rock slice through glassy blue water; where ribbons of vibrant green blanket the earth and dance through a sea of stars in the northern night sky. For such a small country, Norway is overflowing with gifts. And while its infamous Northern Lights are in hibernation during the warmer months of the year, its lesser-known summer offerings are abundant – just head to Oslo in August for a taste of underground techno bursting out of the city center in broad daylight. Sommerøya (English translation: “summer island”) is a small but mighty music-art-culture event in its eighth year running, with an eclectic program that features a mix of local and international techno selectors, art installations, indie film screenings and fervent political debates. 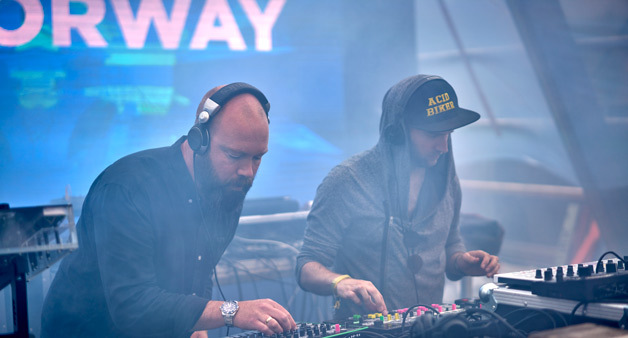 From DJ sets and live performances from Stephan Bodzin, Anja Schneider, DJ Hell, Rødhåd and KiNK, to the likes of homegrown Nordic talent like Finnebassen, Of Norway, Della, +plattform and Fredrik Bekkaasen, Sommerøya draws electronic music aficionados from across the country to its neatly-arranged grounds. Nestled along the glittering, placid waters of the Oslo-fjord, with a sweeping view of the capital city’s downtown district and architecturally renowned opera house – a sleek structure resembling steel origami – Sommerøya brings Oslo to life day and night, over the course of 48 hours. 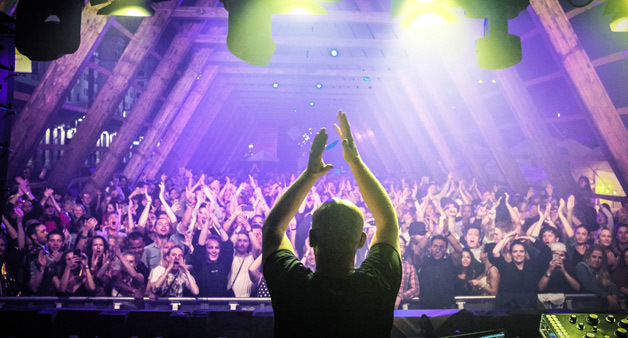 Hosted at Salt Arena, a unique outdoor-indoor traveling venue, Sommerøya’s stages are each tucked inside of 40-foot tall “arctic pyramids”, towering a-frame cages made of wood beams that are replicas of traditional Norwegian fish-drying racks. It’s a visual mashup of smooth Scandinavian design and ancient Nordic heritage. "To have the scenery with such primal, majestic constructions does something to you,” says Anton Solberg, festival manager. He's got that right; the Sommerøya setting is breathtaking. 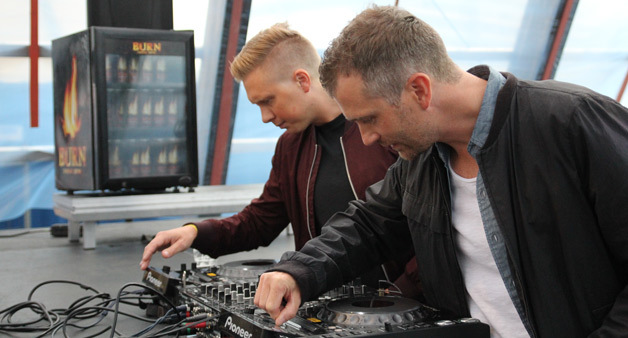 As DJ Mag approaches the festival grounds on a bright, cool afternoon, the sound of a kick drum floats upward, seeping out into the Oslo cityscape. Throngs of ravers make their way through a busy public plaza, rushing towards the music, while tourists and families with young children wander along the bank of the fjord, gazing curiously at the looming wooden festival structures that cast long shadows. A gust of wind whips around us and our Norwegian hosts laugh as we protest the cold: “Welcome to summer in Norway!” they exclaim. It’s August, and it feels like November. But as we come to learn over the course of a few days, what Norway is missing in temperature, it more than makes up for in the warmth of its people. A tall, blond woman wearing butterfly wings and shimmer face paint twirls around, spreading her arms as yards of glittering, gauzy fabric billow in the wind. “If there’s anywhere to wear this, it’s here!” she gushes, offering us a hug before rushing up towards the stage where local duo Of Norway are playing a live set. Her companions are similarly dressed, but the larger crowd is comprised of a mixture of subdued techno hipsters – long black shirts, regrettable felt hats – and festival attire – Burning Man baubles, kaleidoscope prints, feathers and glitter. There are even a few toddlers waddling around, trailing behind their parents like ducklings in the water, their ears covered in giant, neon orange construction-site ear protectors. No matter how raucous the music gets, or packed the dancefloors are, everyone remains even-keeled and respectful. The scene seems a reflection of the small country’s culture: polite, accepting, intellectual and artistically refined, yet decidedly reserved. Our festival host, Tina, jokes that Norwegians are polite but generally shy when it comes to strangers – until they start drinking: “Then we are very fond of strangers and loosen up completely in social contexts,” she proclaims. It turns out, she’s not wrong. Norwegians are also proud; and considering the country of 5 million’s impressive wealth and high standard of living, it’s no wonder. According to the World Economic Forum, in 2017 Norway displaced Denmark as the world’s happiest country (per the World Happiness Report – there really is such a thing). That happiness is measured, quantitatively, by assessing at the balance between economic prosperity and social capital. If the big smiles and happy dancers packed into Sommerøya’s giant arctic pyramids are any indication, this Nordic nation has a healthy dose of both. Still, there are pitfalls in even the best societies, in the most prosperous of cities, like Oslo. Despite Sommerøya’s eight years of persistence, the Norwegian Culture Council has denied the festival any financial support. It’s the topic of a heated debate that takes place inside one of the towering wooden structures – which turns out to be the largest sauna in all of Norway; the heat turned off in its repurposed festival mode. 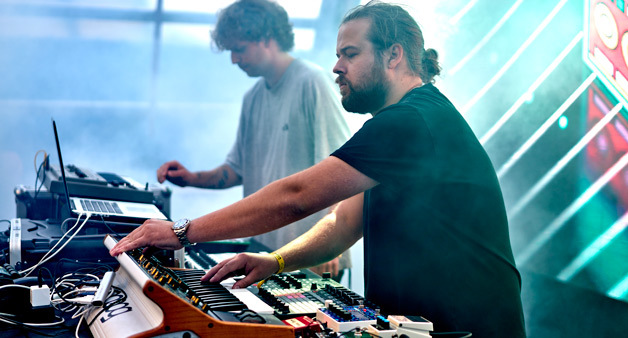 Some of those players make their mark at Sommerøya over the course of two days, treating the audience to impressive live sets like emerging Norwegian star Finnebassen, an Oslo native who serves up moody, melancholic techno using an array of synths and cables spread across the stage. 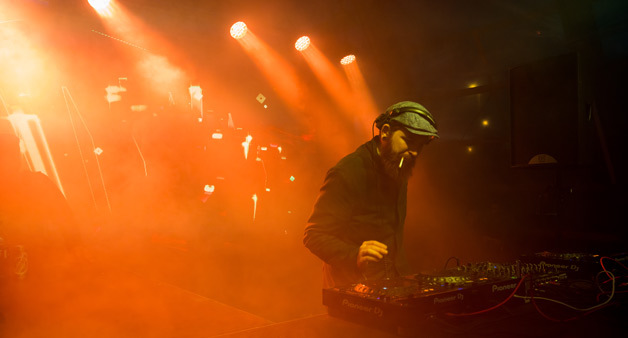 When we catch up with him after his set, he confirms the rumblings that we’ve heard from many of the Oslo locals, ravers and DJs alike: that they feel they have to leave Norway in order to hear the music they love, or have their music heard. Things close early, and despite the presence of renowned dance music venues like Jaeger (which DJ Mag cover star Anja Schneider says is one of the best clubs she’s ever played in her life), and strict alcohol regulations combined with steep prices make throwing parties very challenging. He believes the solution lies with government and law enforcement engaging in constructive debate with promoters, club owners and artists, as opposed to letting things remain status quo and pointing fingers at the music anytime something goes wrong. The sentiment is echoed by other local artists, like Jaeger club resident DJ Kristina Dunn, aka Della, an American expat who moved to Oslo over a decade ago and delights the Sommerøya crowd with her groove-driven house music set. Oslo born-and-bred duo Of Norway – who describe their dubby, alternative dance sound as “like being lost in the woods in Norway” – are clearly proud of their heritage, but agree that the country’s strict regulations present a big challenge to the electronic music scene, citing Sommerøya’s unique, after-work start time and 11pm curfew. “No one really dares to put on a festival here, because it’s difficult to do when you have to shut everything down so early,” they explain, adding that most of their own bookings are in Berlin. 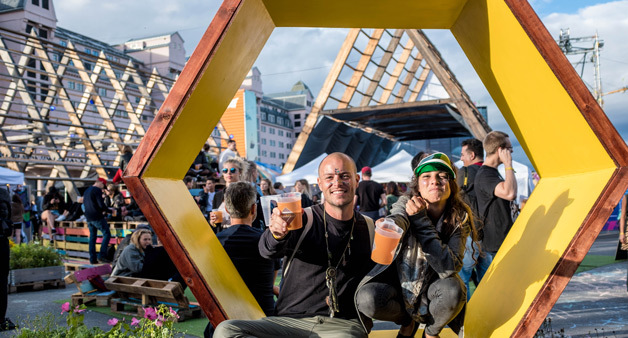 Yet, despite Norway’s high prices, strict alcohol laws and early noise curfews, the festival is vibrant and thriving. Not unlike the conditions from which house and techno music were born, it seems to have overcome a cultural prejudice, pushing its way through Oslo’s neatly-arranged downtown waterfront with creative determination. There are film screenings and production hardware demos, art installations and food trucks. There’s even an afternoon analog synth jam session – aka “Hardware Megajam” – featuring 32 artists each performing on a synth or drum machine at the same time, over a synced tempo clock for two hours. Standing in the middle of the impressive setup, with equipment lined up in long rows of two on either side of the dancefloor and synth geeks grinning broadly, spectators marveling at the yards of patch cables and vintage equipment, it strikes us that Norway’s small but mighty electronic dance music scene is ready for the world stage. By the time early evening rolls around and the chilly summer wind picks up, a thick crowd of smiling people press towards the festival entrance gates, arms waving in the air to the sounds of Anja Schneider taking the party from dusk into darkness. Rødhåd follows her set, closing out Sommerøya’s eighth installment with heavy, hypnotic techno, his red beard ablaze under the stage lights, looking every part the Viking. Every culture has a creation myth, and fittingly, in Norse mythology, the cosmos is constantly being reshaped; creation is ongoing and participatory. Knowingly or not, Sommerøya festival channels its country’s mythological roots: constantly adapting to its environment in form and in function it makes way for new creators and their followers.